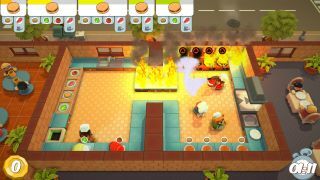 Overcooked is a frantic single-player or co-op cooking game where you’re tasked with zipping around kitchens, cooking and serving food, and ultimately trying your damnedest not to set things on fire. In my experience, preventing the latter is easier said than done. Besides the odd fire, I must admit the folk playing there seem pretty adept in handling shape-shifting kitchens and calamitous cooking. Conversely, my experience mainly consisted of failing to conquer the art of soup and sliding around on dropped tomatoes, as I blamed the three strangers I played alongside for the blazing fire in the corner of the kitchen. Overcooked is due to launch on Steam for £12.99/$16.99/15,99€ on August 3. Pre-orders are available from 6pm BST/10am PT today.